Classic and Vintage RC Cars | We are an internet source for classic RC car pictures and information. From vintage vehicles to pre-modern sports cars, you’ll find it here. Do you remember your first RC car? And that favorite RC car you had years ago? The model cars may be gone, but the memories are not, and we have the pictures to go with them! If you own and drive an original classic RC car, are restoring one, are looking for classic RC car pictures and information, or just enjoy reliving the fond memories you have of a favorite car, I hope you enjoy your visit here. It is a kind of fun look at some of the RC cars of the past. 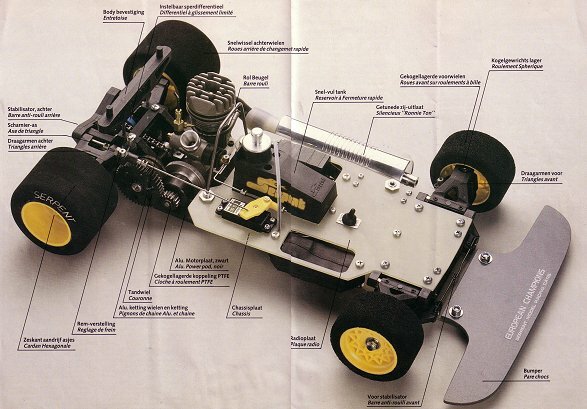 From the beginning, to the nitro RC cars of the 70s and beyond, we’ve got the picture. We even throw in a few facts, figures, and specifications to make it all more interesting. You can find photos of Serpent cars, the Associated RC 100, Kyosho Blizzard, Tamiya’s and much more. We hope you enjoy the site as much as we enjoyed creating it for you and find some things of interest as well. If you want to see the full-sized pictures then click with the right button of your mouse on the picture and choose for ‘open in new tab’ and the picture will open in full size in the new tab! The menu at the side of each page on this site is an easy-to-use way to find and visit the pages you want to see. Point your mouse cursor at a topic listed in the menu, such as Associated, C & F, Graupner, Historic Races, etc., and you can click to open the relative category. You can also click on one of the main topics in the upper bar, and that link will take you to the page for that topic — for example, clicking Classic and Vintage RC Cars will take you to the start -this- page.